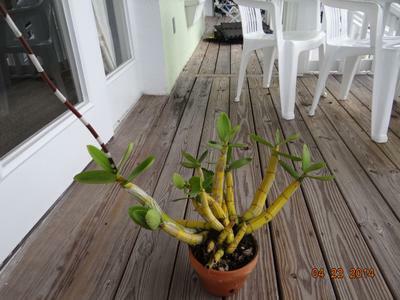 I rescued this orchid from a friend, it was attached to a corn stalk type bark, I separated half and put what you see in the pot, the other half went into a cabbage palm. After nearly 3 years and some expermenting the one in the pot that was placed in the orchid house really started to take hold. I realized that it was enjoying more sunlight then all the others, Phalenopsis, Cattaleyas and whatnot. Just before I moved from Miami to St. Petersburg I went out to the orchid house and this specimen had finally produced a spike and being that it was on top and getting the most sunlight the spike was practically busting through the shade cloth. It's the only one I brought with me and would truly like to know what it is and what is it going to do. As of this writing the spike is actually 4' long and at the nodes, it produces a sweet tasting nectar. I've been keeping orchids for nearly 8 years and never seen anything like it, maybe I wasn't paying attention at the shows but please help, thanks, Mike M.
Comments for Giant Spike, still growing!!! This looks like a Myrmecophila or similar, though it'll only be possible to know for sure once it blooms. The very long spike is typical of these plants, and the vegetative habit looks right too. These generally like bright conditions (as you've discovered), and a bit dry -- similar to the related Encyclia orchids. I agree that it most likely Schomberkia, new name Mymemophilia ( spelling on both not accurate, sorry). Be patient you will be pleased with the blooms.